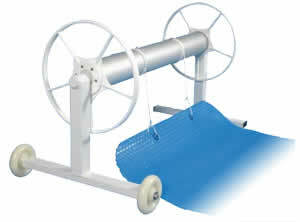 A Solar Pool Blanket will raise the water temperature by up to 8°C. Converting your pool into a giant solar collector, absorbing maximum energy and temperature through the day and preventing heat loss as the outside temperature falls overnight. Lower pool heating costs about 40% - Solar Pool Blankets reduce evaporative heat loss, putting paid to rising energy costs. With a Solar Pool Blanket fitted to your pool, leaves and debris are quickly hosed off the surface of the blanket to be collected in the skimmer box. Save hours each year in time consuming vacuuming and cleaning. Swim months longer each year in a warmer, more inviting pool. 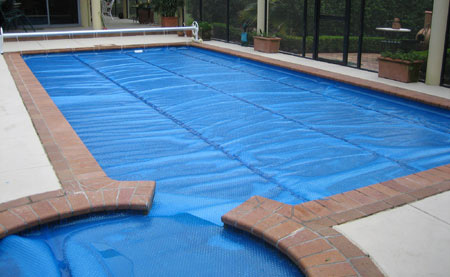 Solar Pool Blankets can reduce evaporation by 97%. During the hot summer months, evaporation can cause the average household pool to lose up to 10,000 litres of water per month. By keeping evaporation to an absolute minimum, a Solar Pool Blanket substantially reduces the need for chemicals to maintain the pool’s correct chemical balance. How does a pool blanket work? The easy passage of light allowed by the translucent material is best for heating. Short wave length solar energy passes easily through the blanket (generating heat like a magnifying glass), this heat is retained by the insulating qualities of the air pockets (similar to double glazing). Darker material tends to impede the flow of light; silver backed material tends to reflect the light like a mirror. 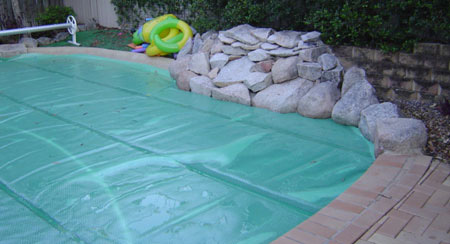 The Solar Pool Blanket material is an excellent thermal conductor (transfers the solar heating quickly to the water). Meaning the blanket heats up and cools down quickly not wasting any solar energy on heating itself up or staying warm. The blanket is an excellent insulator, because the layer of air that sits between the blanket and water, and the air in the bubbles themselves. This air creates a buffer between the blanket and the water that greatly reduces the heat flow out. The blanket also reduces evaporation by 97%. Evaporation is the loss of warm moist air into the atmosphere. Put simply, a Solar Pool Blanket transfers solar heat quickly into the water without wasting energy on heating itself up or staying warm, and the heating gains made during the day are not lost overnight because of the blankets insulation properties. All pool covers are covered by our exclusive pro rata month by month warranty. This means that the factory will pay for the amount of time that the purchaser does not achieve from their solar pool blanket (up to the warranty period). IE: two years for 200 series, 3 years for 300 series, 4 years for 400 series, 6 years for 500 series. It also means that the purchaser must pay for the period of time that they have used the product. All claims should be directed to Free Heat by the end user together with proof of purchase.